The Clement Labassiere murder case which adjourned on Friday, resumes at the High Court today, Monday February 25, 2013. During the trial, the Director of Public Prosecutions called seven witnesses including two doctors. Dennis Leblanc, an agricultural worker and one of the two sons of Ambrose Leblanc, told the court presided over by Justice Birnie Stephenson that the relationship between his family – brother Israel, the deceased Ambrose and Dennis – and the accused Clement Labassiere, turned bad when Labassiere stole a goat belonging to Dennis back in August of 2010. Israel Leblanc, a farmer of Embas, Vieille Case is a son of the deceased, 74-year old Ambrose Seaman, a father of five. Labassiere is his second cousin, and was Ambrose's grandnephew. of Ambrose. The Leblanc men and Labassiere lived in close proximity but each man was on his own. Israel said he left his home about 6:30am for Penville, about three miles away, on Wednesday February 16, 2011. He then received a call about 2:30pm and when he got home he saw his father standing in a room with cloth to his face filled up with what appeared to be blood. He took him to the health centre in Vieille Case then to the Portsmouth Hospital. On examining Ambrose at the Reginald Armour Hospital the doctor discovered that there was a laceration to the forehead 7-8 centimetres long and about 4cm deep. His blood pressure was very high. Brain trauma and blood loss had compensated by raising the blood pressure level. About 3:00pm on Saturday February 19, Israel received a phone call telling him that his father had died. Dennis said he received a call when he was at Layou on his way to Vieille Case on Saturday February 19. Afterwards he attended and identified his father's body ay the autopsy. The report of the autopsy on Leblanc stated that he was well-nourished and he had recently undergone surgery. Besides the head injury, Leblanc's heart was damaged because of the effects of hypertension. He died from the result of a stroke brought on by the effects of the blow to the head. The blow affected his already fragile condition resulting in the stroke. Corporal Royer told the court that Ambrose arrived at the Vieille Case Police Station about 3:12pm with a wound to his forehead and made a complaint against the accused. Royer later met Labassiere and informed him of Ambrose's report that he had thrown stones at him when he was standing on his own property thus causing a wound to his forehead. The policeman asked Labassiere for the stone, but he replied: "I did not hit Ambres with any stone." Labassiere also told the police officer that he had made a report at the police station that same day that Ambrose had damaged his tannia and plantain with a galvanize sheet. "When I asked him to stop he pulled his cutlass behind me, so I had to defend myself with a piece of PVC pipe I was using to roast breadfruit at the time," he told the policeman. Labassiere then handed the officer a two-foot long piece of PVC of half an inch in diameter and burnt at one end. The accused then showed Corporal Royer an area with tannia plants where he struck Ambrose. On Friday February 18, 2011, Corporal Royer arrested Labassiere on suspicion of causing grievous bodily harm to Ambrose Leblanc. Labassiere replied: I am sorry for Ambres but I had to defend myself. On Saturday February 19 at about 4:30pm, Royer received a call from Sergeant Theophile, went to the cells and informed Labassiere that Ambrose Leblanc was pronounced dead at 4:15pm that day. 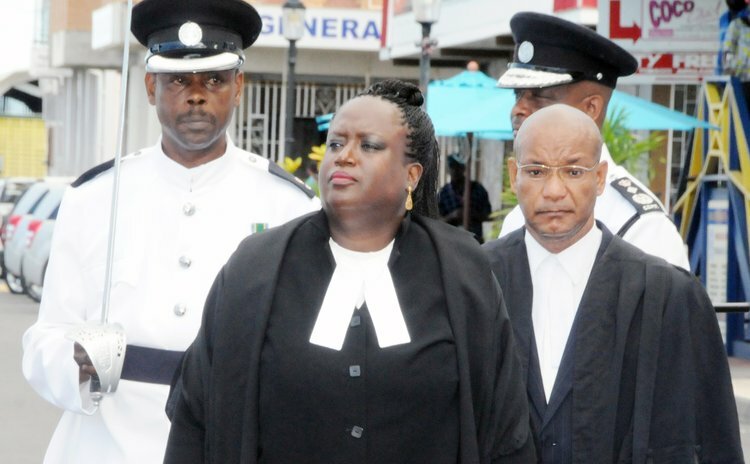 Inspector Abraham had an interview with the accused in Portsmouth and in a witnessed statement claimed to have been farming; he had climbed a breadfruit tree on the land managed by GG, when he heard Ambrose say he had brought back his spade. He came down from the breadfruit tree to pick up his breadfruit. Ambrose Leblanc came at him with his cutlass. In the interview, he said he had grass burning over the breadfruit when he heard a rack-a-tack noise. "I went to speak with him. I walked up to him with a piece of pipe and said 'Ambrose you breaking my garden. You know I go to police already'. The rack-a-tack noise was the galvanize he was taking for the boundary. He put the galvanize on a tannia and walked on me with a cutlass in his hand. I pitched the piece of pipe at him. It hit him on his head. He fell. I ran for the piece of pipe. The pipe bounced on his head and pitch go," the accused said.